If you’ve been listening to the daily Closing Market Report you’ll know that many of the analysts have been on the road for the winter meeting circuit. I hope you get a chance to catch up with some of them or maybe me. I’ll be out next week with the folks from Farm Credit Illinois. You may see the dates and times here. These are crop insurance and marketing meetings. Strategic Farm Marketing will be doing a similar program. You may see their winter meeting list later in this letter. The farmdoc team will be out, too. Although that’ll happen in mid-February. 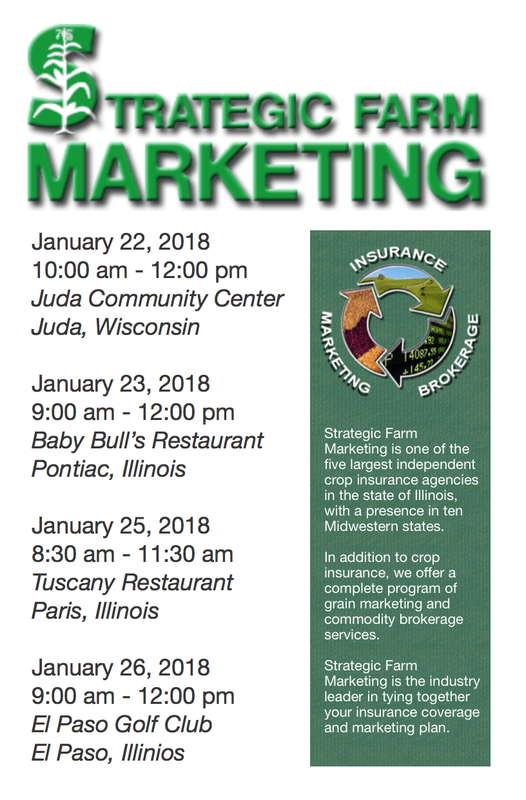 Registration is already open for the “2018 Resilient Farm Roadshow | Building habits to become profitable Farm Managers”. If you or your organization is still planning an event contact me at (217) 333–9697 or tgleason@illinois.edu. I’ll be glad to talk with about bringing a WILLAg Marketing Panel to your meeting. Or if you’d prefer, just to give you the contact information for the University of Illinois ag economist, weed scientist, entomologist, or plant pathologist of your choice. I can also put you in contact with any of the analysts you hear on WILLAg. It is dry in the United States from Texas to Illinois. Frankly, that’s not a big deal right now or a marketing plan. It could become something later on in the year, but the odds don’t really correlate in any fashion. 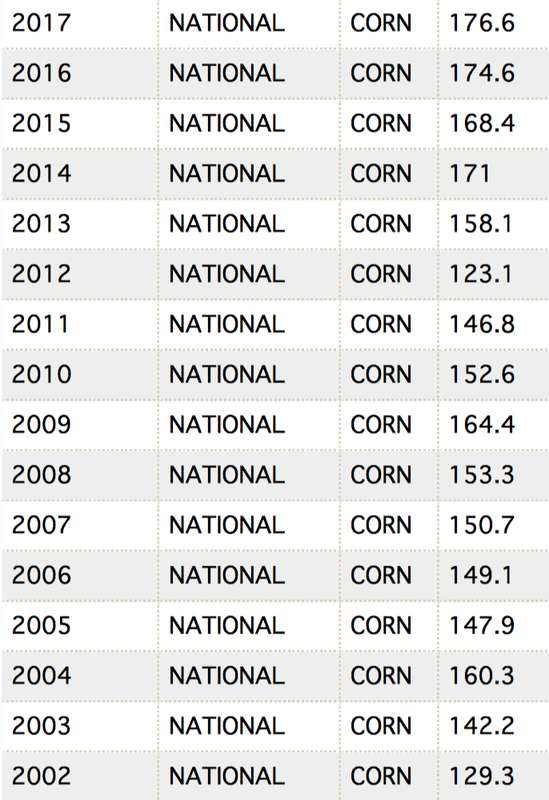 Here is proof from the USDA NASS National Average Yield database. 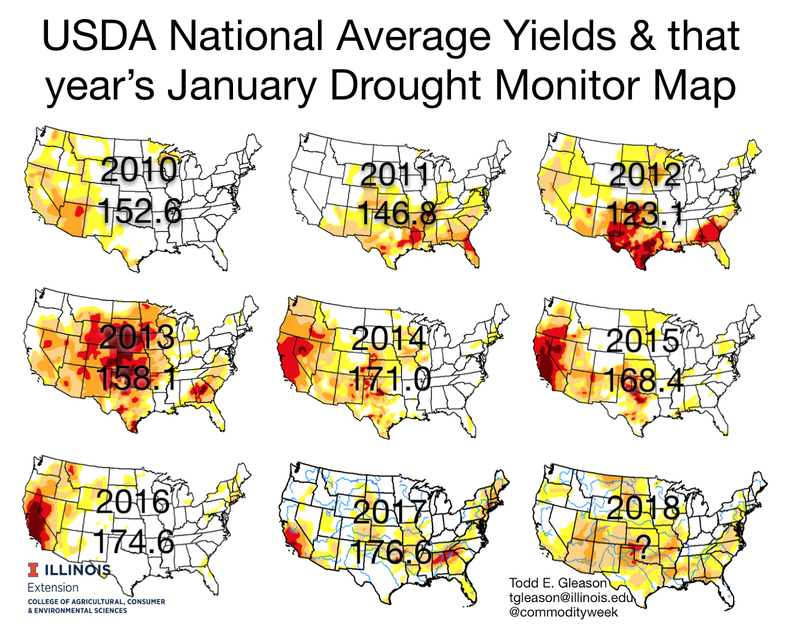 What you see is the average national corn yield for each year since 2010 imposed on a January Drought Monitor map. 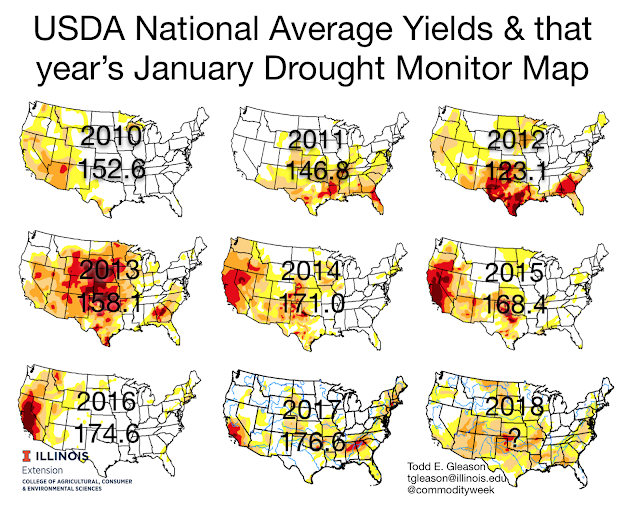 The U.S. Drought Monitor is produced through a partnership between the National Drought Mitigation Center at the University of Nebraska-Lincoln, the United States Department of Agriculture, and the National Oceanic and Atmospheric Administration. Spring rains, more often than not, alleviate dry conditions. You may view the National Average Corn Yield database going back to 1866 (24.3 bpa) using this link. 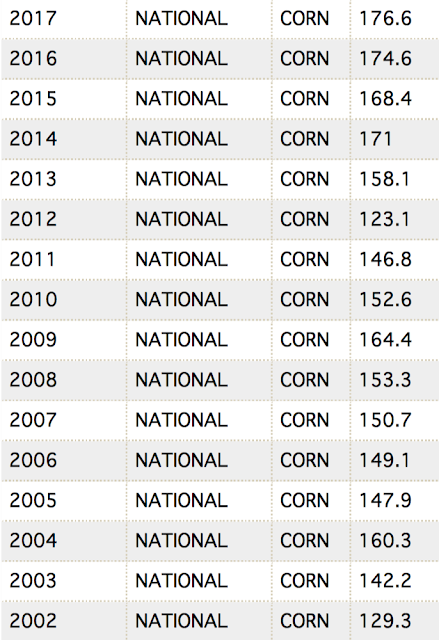 Here’s a quick view of the National Average Yields database for corn going back to 2002. The agricultural economists at ILLINOIS believe there are three recent historical commodity price eras. For grain prices, these run from post World War II to 1973, from 1973 to 2006, and from 2006 to the present. What they’ve found to date is that grain prices, unadjusted for inflation, tend to move within a range during these eras. Pre-register and find full details of the upcoming Strategic Farm Marketing winter meetings at www.sfarmmarketing.com. Meetings run through mid-February. Be sure to check the full schedule online for a program near you. Women involved in agriculture and wanting to learn more about managing risk on the farm can sign up for Annie’s Project classes this winter. Annie’s Project was originated by Ruth Hambleton before she retired from Illinois Extension. Annie’s Project – Education for Farm Women is a 501(c)(3) nonprofit organization dedicated to providing educational programs (Annie’s Projects) designed to strengthen women’s roles in the modern farm enterprise. Currently, classes are being taught in 33 states. Annie’s Projects foster problem solving, record keeping, and decision-making skills in farm women. The six educational sessions of the course include topics from the five risk areas. As Annie’s Project has been localized to meet the needs of farm and ranch women across the country, topics or emphases may vary.